EDITOR’S NOTE: This story is part of Elemental: Covering Sustainability, a new multimedia collaboration between Cronkite News, Arizona PBS, KJZZ, KPCC, Rocky Mountain PBS and PBS SoCal. 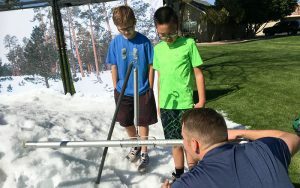 PINE – The Salt River Project’s annual water expo this year featured a “snowpack simulator” – a pile of cold, wet, white stuff on a hot, sunny day in Tempe. SRP hydrologist Andrew Volkmer strapped snowshoes on two young boys while their guardian watched. This was the first time the kids had worn snowshoes; their guardian suggested that someone first explain to them what snow is. Volkmer’s job that day was to do just that and explain why snowfall so important for the state’s water supply. That message is critical this year because most of the West is under stress from climate change and other factors. Water managers say that as of March 1, Arizona’s snowpack was far below normal, at 28 percent. The season ends April 1, leaving little time to turn things around. That would be one of the lowest totals in 105 years of recordkeeping. With help from the two boys, Volkmer plunged a hollow aluminum tube into the waist-high snowpack simulator. He pulled it out and looked at a slot in the pole that showed the depth of the snow. He put it on a scale and weighed it, to shows how much water would result once the snow melts. The same process is used wherever snowfall data are collected. 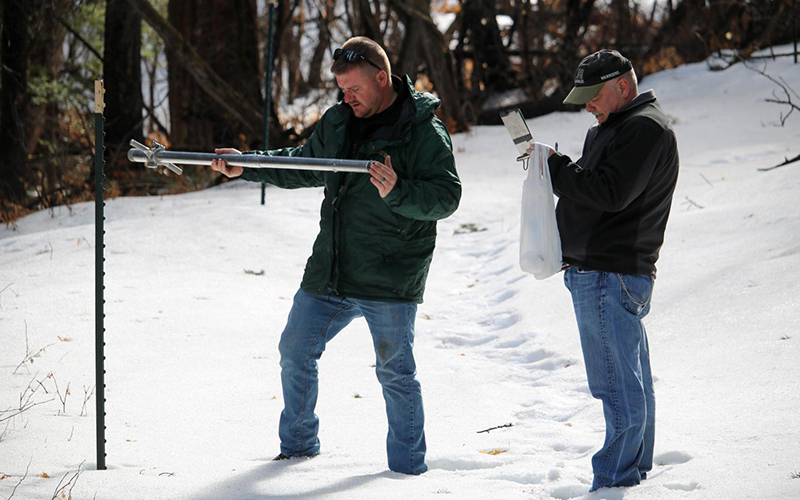 Hydrologists measure and weigh the snow to calculate the eventual runoff, then record their findings. At the Tempe event, Zarena Brotestante and her mother learned how snow melts to become the water that flows from their taps. As of mid-March, SRP reservoir levels are 61 percent full. Not great, but not terrible either, said Charlie Ester, surface-water resource manager for SRP. “We’re actually in pretty good condition,” he said. That’s all because of longterm planning. Ester said SRP plans 11 years ahead for water supply. The winter snow in eastern Arizona’s high country melts and goes into the Salt and Verde rivers. SRP has dammed those rivers to fill reservoirs, which are managed and sent through canals for agricultural and urban use. Because there’s less than half the typical snowmelt replenishing those reservoirs, Ester said SRP will use more groundwater to supplement. Everyday water users don’t have to worry about cutbacks now, he said, but water in the desert is a luxury. It’s also important to educate metro Phoenix residents about where their water comes from, Ester said, because so many people come from somewhere else. Most of metro Phoenix’s water starts 100 miles away as snow falling in the mountains near Pine, east of Camp Verde. 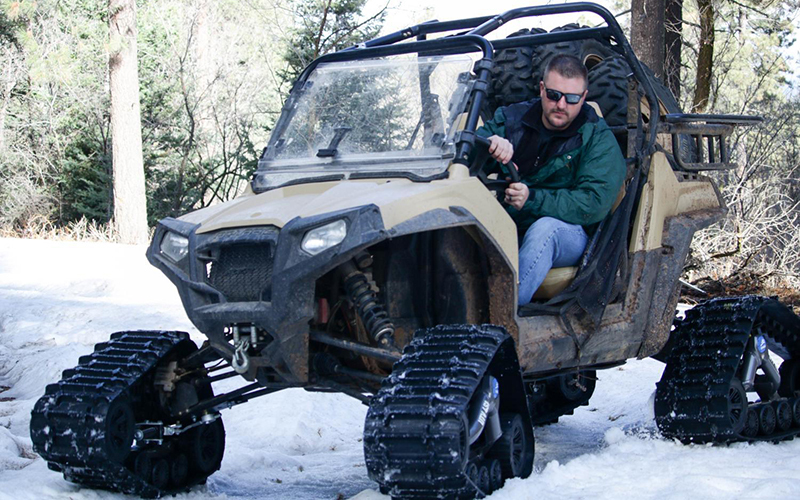 There, U.S. Department of Agriculture engineer Travis Kolling drives an all-terrain vehicle to get to a testing site. At the end of an old forest road, the evergreens grow tall and thick. There’s practically no snow, but closer to the collection site, sparkly white patches appear. 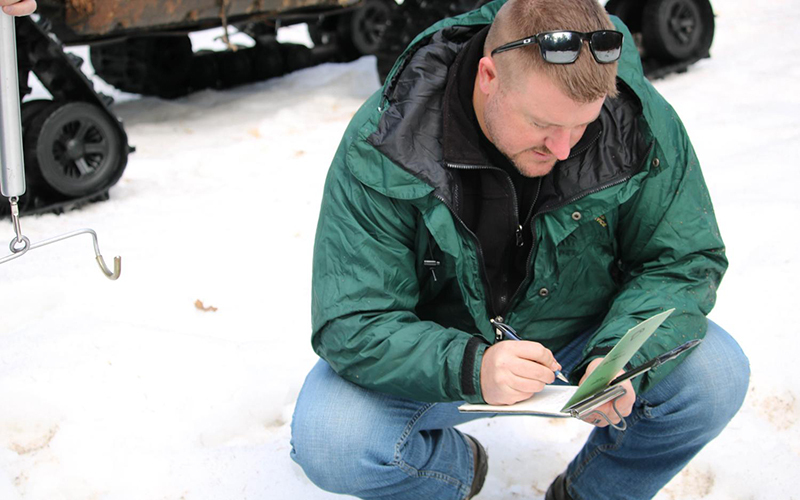 The snow crunches underfoot as Kolling and an assistant, who are with the USDA’s Natural Resource Conservation Service in Arizona, collected data. Their boots sank into the snow. “Usually, we have to wear snowshoes for this,” Kolling said. His assistant jotted down the inches of snow before Kolling dumped the sample into a bag for weighing. “This is our official snow-survey Walmart bag,” he said. Arizona had a wet winter last year, but this year looks like drought conditions again. Collecting snow data is a low-tech procedure that’s basically unchanged since such measurements began in the 1920s. That has resulted a rich data set for such scientists as Philip Mote, director of Oregon Climate Change Research Institute at Oregon State University. “The number of trends going down is a lot relative to (the data’s) variability was much, much greater than what you expect by chance,” Mote said. Mote led a study that found the Western snowpack across the board is declining due to climate change. Arizona showed a greater decrease than most Western states. Mote isn’t sure why Arizona stands out, but overall, warmer surface temperatures mean less snow and therefore less runoff on average. “Indeed, the warming trends we have observed are the culprit in the decreases in snowpack that have been observed,” he said. Mote ran the data through a model twice: once with observed climate-warming trends and again without. Only the climate-change simulation mirrored real-life snowpack numbers. Water managers will keep worrying about water supply, like they do every year.